I was at my friend, Jane Nelson’s house last week and she knew all my doll quilts were packed so she let me take some pictures of her collection! I hope you enjoy them as much as I did. 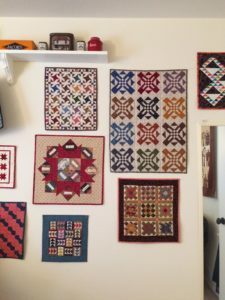 I just love the way she groups them on the wall of her quilt studio. The grouping grows as she makes more, and I like the randomness of it. Maybe this will inspire you to have a new idea for displaying some of your little gems. 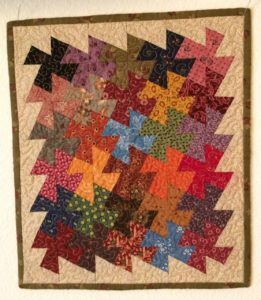 This sweet piece is made of flying geese with a little strip on each side to make up the block. 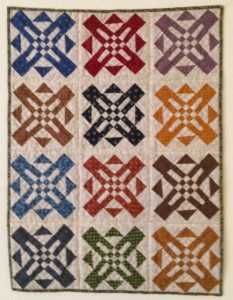 I love the variety of civil war reproduction fabrics she has used and if you can enlarge it you will see that it is hand quilted (which she often does). It makes a little quilt drape so nicely as well as adding to its charm. The next one is from the same wall and has a unique block. 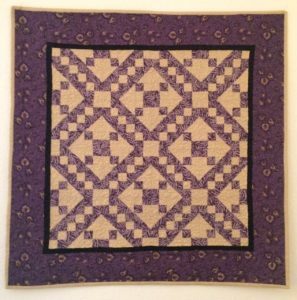 The center is a 9-patch surrounded by strips of three fabrics, then HST, squares and outer triangles. It looks beautiful using all different colors set in muslin. Her squares are only about 4” but it would also be stunning done in 12” blocks and make it large enough for your bed. This little twisted Pinwheel (pattern from Primitive Gatherings) is one of those projects that is easily made if you have the plastic template and it comes in different sizes. Jane made hers in the small template and I think it turned out adorable. What a great way to use up scraps. One more to share today is the one she calls her personal favorite. It is made up of several purples and one cream fabric. It is 16 Jacobs Ladder blocks set together in alternating directions. Each block is made of five 4-patch blocks and 4 HST blocks but when set together they make a great secondary pattern. It is always so fun to see another collection of doll quilts and I have enough pictures to share more next time. If you ever want to send me pictures of some of your little quilts I would love to see them (see my email below). 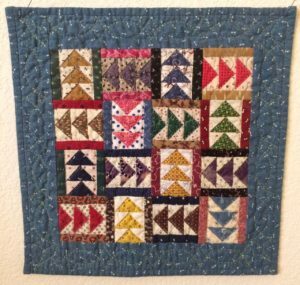 Just for You – Quilt Quote “May all your ups and downs in life be with a needle and thread”.